The last "Spee-D-Twin" engine produced. The Soulé Steam Feed Works was founded by George Soulé in 1891 and was known for many patented innovations in steam engine technology. It reached its height around the turn of the century and produced products sold around the world. 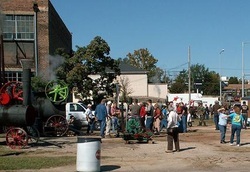 Steam feed refers to the flat belt drive shaft that powered the individual machines in the shop. This drive shaft is the longest operating drive shaft in the country. The Soulé "Spee-D-Twin" was produced until 1984. It was a favorite among sawmill operators. 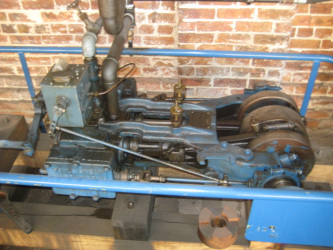 It was a small two cylinder reciprocating engine and featured a valve that allowed the engine to operate in both forward and reverse. The factory closed in 2002 leaving everything in its original place. The museum is located in the Union Station Historic District of Meridian and was placed on the National Register of Historic Places in 1979.